JERUSALEM — U.S. troops will not leave northeastern Syria until Islamic State militants are defeated and American-allied Kurdish fighters are protected, a top White House aide said Sunday, signaling a pause to a withdrawal abruptly announced last month and initially expected to be completed within weeks. Bolton said in Israel that the U.S. would pull out only after its troops had rooted out what’s left of IS in Syria and after the administration had reached an agreement with Turkey to protect Kurdish militias who have fought alongside Americans against the extremists. The president did not offer a timetable in the initial announcement last month about the approximately 2,000 U.S. forces. But officials said at the time that while many details were yet to be finalized, they expected American forces to be out by mid-January. Trump’s decision last month drew widespread criticism from allies, led to the resignation of U.S. Defense Secretary Jim Mattis and raised fears over clearing the way for a Turkish assault on the Kurdish fighters. Turkey considers the Syrian Kurdish People’s Protection Units, or YPG, a terrorist group linked to an insurgency within its own borders. Bolton said the U.S. wants its Kurdish allies in Syria protected from any planned Turkish offensive — a warning to be delivered to Turkey’s president, Recep Tayyip Erdogan. Bolton said Trump has made clear he would not allow Turkey to kill the Kurds. “That’s what the president said, the ones that fought with us,” Bolton said. Bolton said the U.S. has asked the Kurds to “stand fast now” and refrain from seeking protection from Russia or Syrian President Bashar al-Assad’s government. “I think they know who their friends are,” he added, speaking of the Kurds. Turkey’s presidential spokesman called allegations that his country planned to attack the U.S.-allied Kurds in Syria “irrational” and said Turkey was fighting terrorism for national security. In comments carried by the official Anadolu news agency, Ibrahim Kalin said the Kurdish fighters oppressed Syrian Kurds and pursued a separatist agenda under the guise of fighting IS. “That a terror organization cannot be allied with the U.S. is self-evident,” he said. U.S. Rep. Adam Smith, the incoming chairman of the House Armed Services Committee, told ABC’s “This Week” that the conditions raised by Bolton were “obvious,” and Smith criticized the conflicting messages from the Trump administration. “We don’t want ISIS to rise again and be a transnational terrorist threat and we don’t want our allies, the Kurds, to be slaughtered by Erdogan in Turkey,” said Smith, D-Wash.
Bolton said U.S. troops would remain at the critical area of al-Tanf, in southern Syria, to counter growing Iranian activity in the region. He defended the legal basis for the deployment, saying it’s justified by the president’s constitutional authority. The U.S. is also seeking a “satisfactory disposition” for roughly 800 IS prisoners held by the U.S.-backed Syrian opposition, Bolton said, adding talks were ongoing with European and regional partners about the issue. 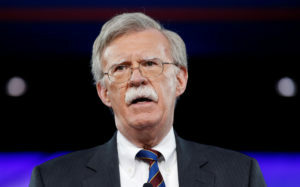 Bolton was to have dinner with Israel’s prime minister, Benjamin Netanyahu, on Sunday to discuss the pace of the U.S. drawdown, American troop levels in the region, and the U.S. commitment to push back on Iranian regional expansionism. Bolton was expected to explain that some U.S. troops based in Syria to fight IS will shift to Iraq with the same mission and that the al-Tanf base would remain. Bolton also was to convey the message that the United States is “very supportive” of Israeli strikes against Iranian targets in Syria, according to a senior administration official, who was not authorized to publicly discuss Bolton’s plans before the meetings and spoke on condition of anonymity. Associated Press writers Zeynep Bilginsoy in Istanbul and Catherine Lucey in Washington contributed to this report.